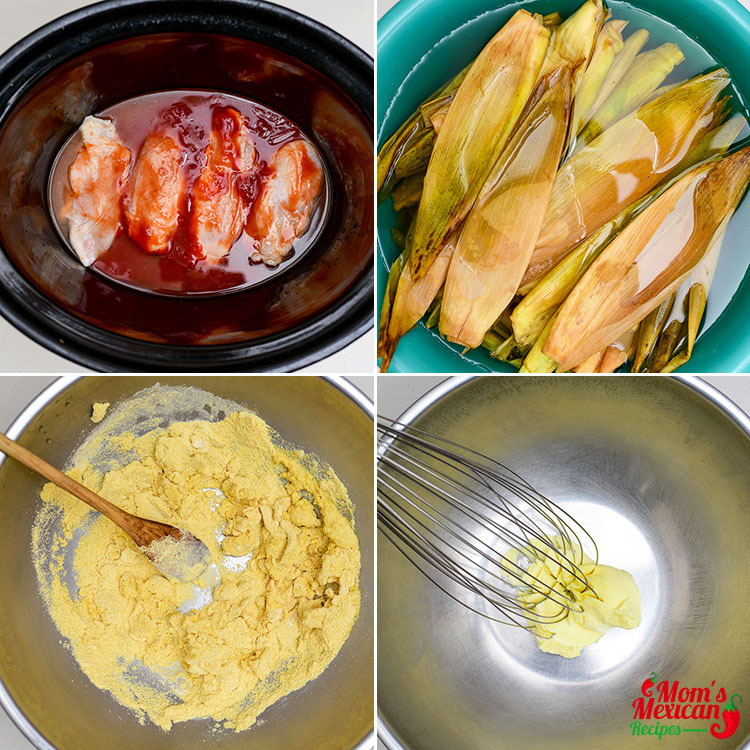 Shredded Chicken Tamales Recipe in Mexico, tamales begin with a dough made from corn (hominy), called Masa, or a Masa mix, such as Maseca, and lard or vegetable shortening. 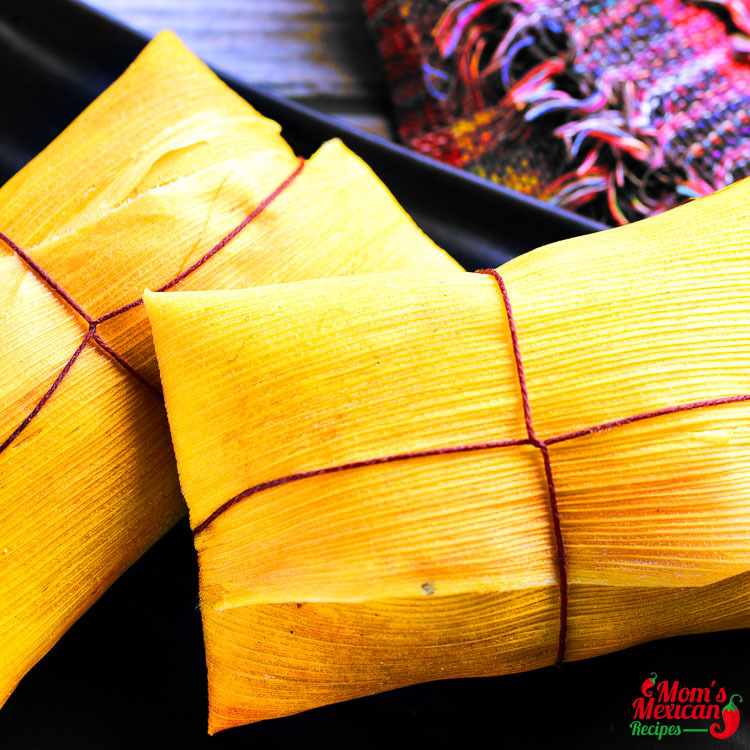 Tamales are generally wrapped in Corn Husks or plantain leaves before being steamed, depending on the region from which they come. They usually have a sweet or savory filling and are usually steamed until firm. Tamale-making is a ritual that has been part of Mexican life since pre-Hispanic times when special fillings and forms were designated for each specific festival or life event. 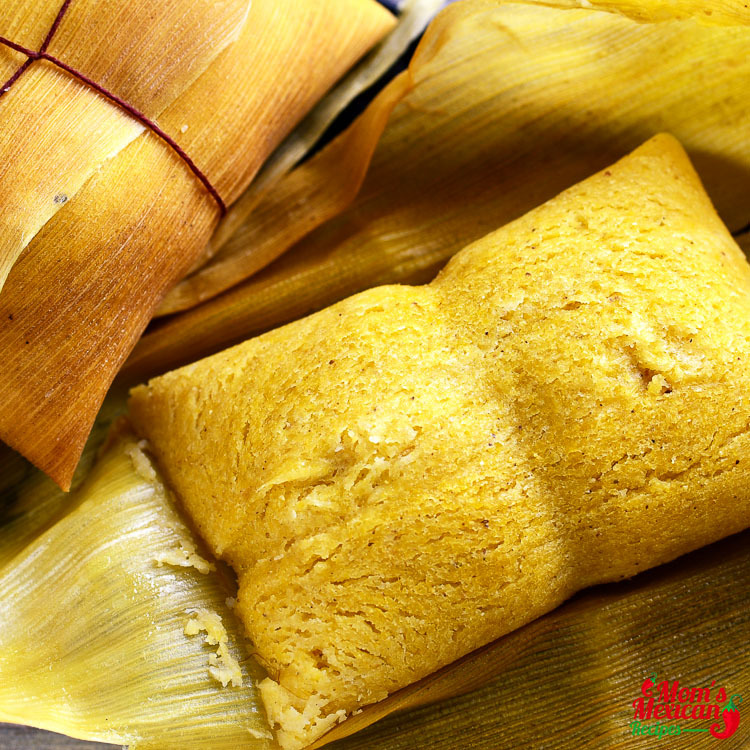 Today, tamales are typically filled with meats, cheese or vegetables, especially chilies. Preparation is complex, time-consuming and an excellent example of Mexican communal cooking, where this task usually falls to the women.Tamales are a favorite comfort food in Mexico, eaten as both breakfast and dinner, and often accompanied by hot atole or Champurrado, Roasted Poblano Soup, and Arroz con Leche (Rice Pudding) or maize-based beverages of indigenous origin. Street vendors can be seen serving them from huge, steaming, covered pots (Tamaleras) or Ollas. Prepare the crockpot or slow cooker. Pour two cups of chicken broth into the crockpot. Add the 15 oz. can of tomato sauce, two tablespoons of Sofrito, 1 tablespoon of Ricarito, and one tablespoon of garlic salt. Mix well with a spoon. Add the chicken, and make sure the chicken is covered in the broth and tomato sauce mixture. If your crock pot happens to be deeper or wider than mine, just add more broth or water until the chicken breasts are submerged. Cook for 3 hours on high. Shred the chicken. Using two forks, shred the chicken into pieces. The chicken should pull apart easily. Prepare the Veggies. I brought the tablespoon of butter and tablespoon of cooking oil to boil in a pan and I pan fried the diced onions, orange bell peppers, and red bell peppers. Prepare the masa (batter). Mix the corn flour, baking powder and salt in a bowl. Add the chicken broth or water and mix thoroughly. Prepare the lard or vegetable shortening. I used a hand mixer to mix the shortening to whip air into it and to ensure a nice smooth mix. Once it was soft and smooth, I added it to the masa mix and blended until completely combined. Prepare the tamales with filling. Take a corn husk and remove from the water. Lay it on a flat surface. First, take ½ to ¾ cup of masa and place it on the corn husk – create a ditch inside the masa for the filling. Add a teaspoon to a tablespoon of the cooked bell peppers and onions to the masa. You can also add a few pieces of diced olives. Add one to two tablespoons of the shredded chicken mix to the “moat”. Cover the chicken with a flattened piece of masa and use your fingers to join the masa top to the masa bottom. Enclose the masa in the corn husk. Fold the shortest side up over the masa first, then the side across from it, and then the two other sides. Use baker’s twine to tie everything together. You don’t want the corn husk too tight – you need to leave a little room for the masa dough to expand. Steam the tamales for 45 minutes. I actually like the what is being wrapped on the Shredded Chicken Tamales Recipe because it’s very natural and unique, though preparing Tamales will take a long time starting from the salsa up to the corn masa that I think it should be done a night before you cook so it would be less hassle for you, and one more thing is you should more focus on your salsa just to bring up the richness taste of the tamales recipe, be careful and always estimate the right amount of the water that you put in your salsa so you can make it smooth. 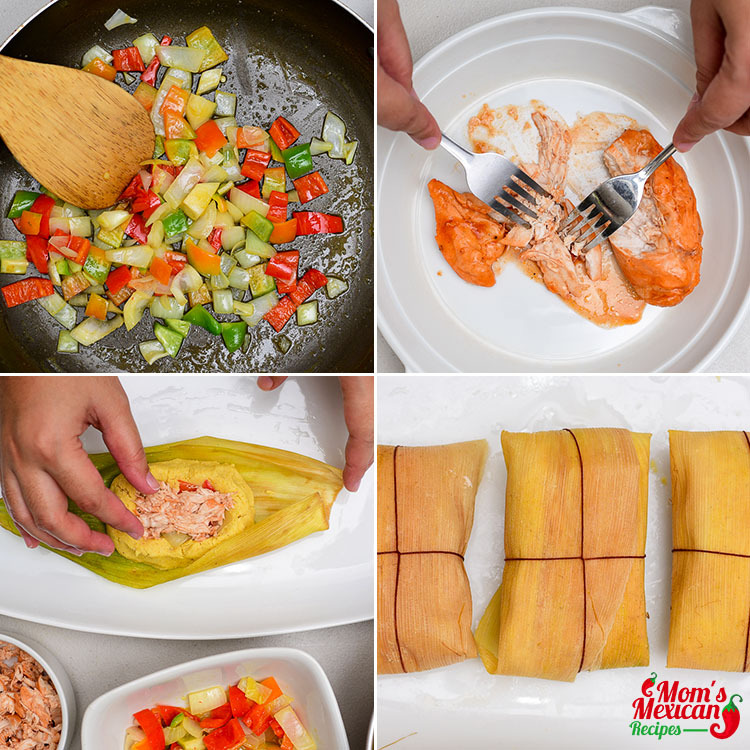 It is more fun if you will do the Shredded Chicken Tamales Recipe with your family. 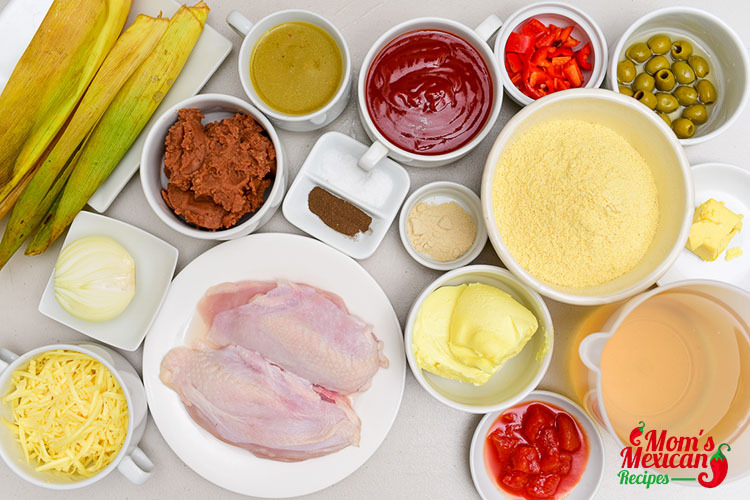 Let them help you to work with your delicious recipe and at the same time bond together while all of you are preparing your meal. 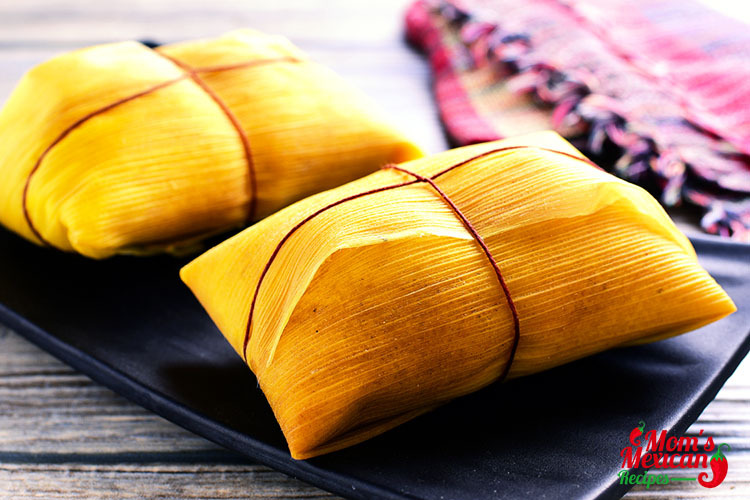 Tamales are usually eaten during festivities, such as Christmas, the Day of the Dead, Las Posadas, La Candelaria Day (February 2) and Mexican Independence Day.